San Francisco residents have voted against tighter restrictions on short-term vacation rentals, in a major victory for Airbnb. One of the most contentious issues on San Francisco's ballot Tuesday was Proposition F, more commonly known as the Airbnb proposition, which aimed to crack down on short-term rental properties. The measure was closely watched around the country as other cities struggle with vacation rental regulations. With 100% of precincts reporting, the California Board of Elections website said the measure was voted down 55% to 45% on Tuesday night. San Francisco is in the middle of a housing crisis, fueled by an influx of well-paid workers at technology companies and a shortage of housing to accommodate them. Supporters of Prop F said by turning their units into short-term rentals, landlords are further limiting the long-term housing that's available and pushing lower and middle class residents out of San Francisco. Critics of Prop F, led by Airbnb, said the proposed rules were "too extreme" and would have had a negligible impact on the housing supply. Proposition F wanted to limit all short-term rentals to 75 days a year. Currently the limit is 90 days when the primary resident isn't present, and unlimited if the home is occupied by the host at the same time. It also would have required hosts to show proof a unit was authorized for short-term rentals, and then submit quarterly reports on occupancy. The law would have applied to all properties listed on services such as HomeAway, VRBO and FlipKey, but would have had the biggest impact on Airbnb. "Tonight, in a decisive victory for the middle class, voters stood up for working families' right to share their homes and opposed an extreme, hotel industry-backed measure," said Airbnb in a statement. Sharebetter SF, a coalition supporting Prop F, said in a statement losing was a disappointment, and that the the measure would not have been on the ballot if "Airbnb were only about people renting spare rooms." "The fact is rampant abuse of short-term rentals is taking much needed housing off the market and harming our neighborhoods," the group said. Since launching in 2008, Airbnb has become the go-to way to rent out homes or spare rooms for short-term use. Valued at $25 billion, it's one of the most valuable private companies in the world, according to PrivCo. Airbnb spent nearly $8 million to defeat the proposition, according to the San Francisco Ethics Commission. Supporters raised less than a million dollars. Critics of Prop F said the measure is a misplaced attempt to fix a decades-long housing crisis. They claim many of the people renting out their homes on Airbnb are actually middle-class homeowners trying to make extra money to put toward their own ballooning housing costs. "City residents have rejected the divisive policies of Prop. 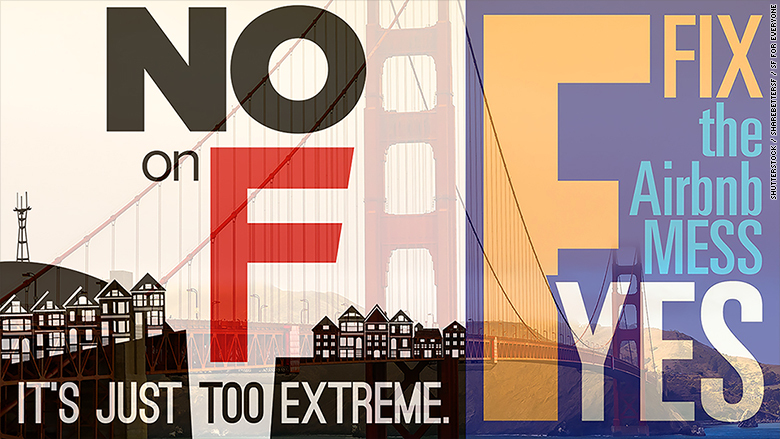 F and demonstrated their support for the middle class San Franciscans who depend on home sharing to pay their bills and stay in our community," said No on F campaign manager Patrick Hannan. According to a July investigation by the San Francisco Chronicle, only 350 San Francisco homes listed on Airbnb appear to be full-time rentals. Airbnb won despite its own recent embarrassing stumble. A citywide ad campaign touted the $12 million in taxes the company pays with snarky suggestions for how to use it -- like keeping libraries open longer or adding bike lanes. It struck many as tone-deaf and smug -- and Airbnb pulled it the day after it launched. Prop F wasn't the only real estate measure on the ballot in San Francisco. Residents voted against a moratorium on building new market-rate housing in the rapidly gentrifying Mission District. However, they voted overwhelmingly for a $310 million bond for building affordable housing. Supporters of Prop F have indicated they will try to get a similar measure on next year's ballot.